The Sigma IDE can be used to integrate Amazon SES directly into your serverless application. Sigma IDE provides the ability to send emails using Amazon SES. Users have the ability to select and existing verified email or a new email. To use SES resource for operations, it should be dragged from the resources panel and dropped on the required line of the lambda code editor. Then user should select either Use An Existing Verified Email tab or Register A New Email tab based on the requirement. If it&apos;s required to send emails from an already verified email address, first user should select the Use An Existing Verified Email mode tab. Then the verified email addresses will be listed in the Email drop down list. 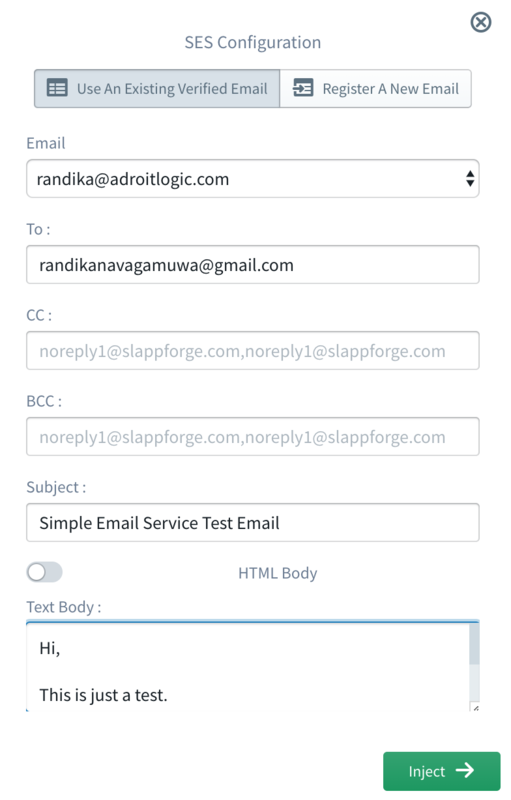 User can easily select the required email from that drop down list. Once user selects the email address, all the other required information should be provided. Email The From: field of the message. To The To: field(s) of the message. CC The CC: field(s) of the message. BCC The BCC: field(s) of the message. Subject The subject of the message: A short summary of the content, which will appear in the recipient&apos;s inbox. Body The content of the message, in text\html format. Format can be chosen according to the user&apos;s preference. If user prefers to register a new email address instead of using an already verified email address, first user should select Register A New Email mode tab. After clicking on the Send verification email button, a verification email will be sent to the provided email address. As soon it&apos;s verified, it will be available for user to select. 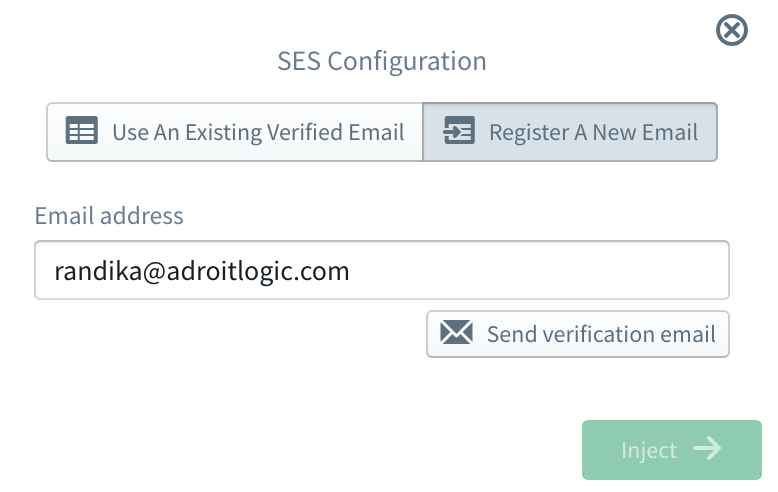 When it comes to Amazon SES, by default users are only allowed to send emails to verified email addresses. So user has to use a verified email address(s) for the To: email(s) as well. This limitation can be removed by opening an SES Sending Limits Increase case in Amazon Support Center. More information regarding this limit can be found from here.